so do the institutions we build. While it is easy to identify intentionally built systems of oppression like Jim Crow or the paralysis caused by the glass ceiling for women in the workplace, confronting systems that perpetuate subtle, unconscious bias is much harder. 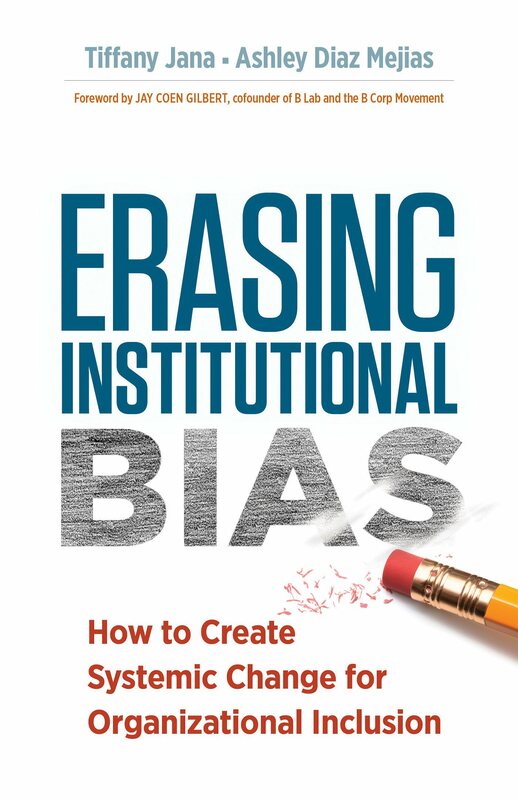 Erasing Institutional Bias will help people tackle structural bias regardless of their positional power. Eliminating systemic bias can seem an insurmountable task from the vantage point of an ordinary individual, yet Jana and Diaz Mejias empower readers to recognize that each of us has the ability to affect systemic bias through a deliberate, coordinated effort. Institutional bias afflicts all industries—including business, education, health care, government, tech, the arts, nonprofits, and finance and banking. Among the types of institutional bias addressed are hiring bias, gender bias, racial bias, occupational bias, and customer bias. Jana and Diaz Mejias focus their attention on bias in the workplace and give readers practices and activities to create organizational trust to challenge these implicit biases. Erasing Institutional Bias will help people recognize that each of us has the power to affect systemic bias. Each of us can evaluate our own current role in perpetuating systemic bias and define our new role in breaking down systemic bias. TIFFANY JANA is the founder and CEO of TMI Portfolio, a collection of socially responsible and interconnected companies working to advance more culturally inclusive and equitable workforces. TMI Portfolio’s consulting arm, TMI Consulting, Inc. is a Certified Benefit Corporation and 2018 and 2016 Best for the World Honoree. Dr. Jana is an international public speaker, and has appeared on stages in the United States, Spain, Germany and Hong Kong. Dr. Jana won the 2017 Enterprising Women of the Year from Enterprising Women Magazine, Diversity Journal’s Women Worth Watching Award, and was recently named one of the Top 100 Leadership Speakers for 2018 on Inc.com. Dr. Jana has been featured in featured in Forbes, Psychology Today, Huffington Post, MarketWatch and Fast Company. Dr. Jana's first book Overcoming Bias, received an endorsement from 2016 Vice-Presidential candidate Tim Kaine. In addition to two books on bias, Dr. Jana co-authored the 2nd Edition of the B Corp Handbook. Ashley Diaz Mejias earned her MA in Religious Studies at the University of Virginia and her MDiv at Union Presbyterian Seminary in Richmond. Ashley has devoted her academic work to researching and writing on racial bias and has written for blogs and led curricula for institutional conversations on race, systemic bias, and mass incarceration.